doing so will print a single sentence at the top of the page: "stay tuned for act 8"
doing so will print a single sentence at the top of the page: "stay tuned for Act 7: Act 1: Act 2"
So uh does anyone remember what was happening? I don't. The various versions of Jack Noir (Spades Slick, from Alternia, all cyborged out; Bec Noir, from our kids' pre-scratch universe; and "Union Jack" (? ), who is, according to SS's assessment, "the closest thing passing for [Lord English] in this session") are all just about simultaneously converging on the post-scratch session. The kids have been preparing for the big fight and are at their various stations (thanks to Vriska's strategizing and Jasprosespritesprite's shenanigans). Last we saw, the ghosts of Vriska and Terezi from before the John/Terezi retcon just met, and our current alpha-timeline Terezi lamented that she couldn't personally learn from all the mistakes and experiences and memories of all the various alternate versions of herself, right before tapping in to her Seer of Mind powers and doing just that. Hussie wrote himself into a corner by killing the worst character, then everybody else. So he literally went back and re-wrote the pages where the worst character died so she didn't die and somehow that meant everybody else lived too. Now everybody's screaming towards the big finale and there are like 400 unresolved plot threads and he's seriously gonna resolve all of them in 6 days then a music video then 7 days. gaze upon the end, ye mighty, and despair! Oh also we maybe learned just before the pause that, when you die on your quest bed, the "you" that dies becomes a ghost, and therefore isn't directly the same "you" as the one that becomes god-tier. But they're all still you, and there are weird metaphysical connections between different versions of the same person (see the above re: Terezi), and sometimes even more specific connections like when Rose "survived" her timeline's death (doomed by John's death / Cal's prototyping) by dream-projecting back to the main timeline's Rose. I just read this page after not having read anything on MSPaint Adventures since the early Problem Sleuth days and knowing nothing about Homestuck other than it involves a bunch of grey-skinned trolls with zodiac symbols. So that was a hoot. Oh also we maybe learned just before the pause that people die when they are killed. For what it's worth, that's a solid post, Nich. I am disheartened by the suggestions that Space players grow into their aspect by way of prolonged loneliness and self-reliance and that a mind without barriers to the memories of other selves wouldn't be able to hold together. I think we have reason to suspect those might not be entirely the case. For the former, this is not a fully-realized Jade, and I don't think a version of Calliope who "predominated" like this and holds the human disease known as friendship in such low regard can be really in tune with the true metaphysics of the world or her aspect. For the latter, we have a few examples of characters who are able to more fully commune with their "Hearts" - not just the spritesprites, but also Terezi (by virtue of Mind) - which suggests that it's not a hard limitation, but something that requires work and growth and/or magic shenanigans to overcome. 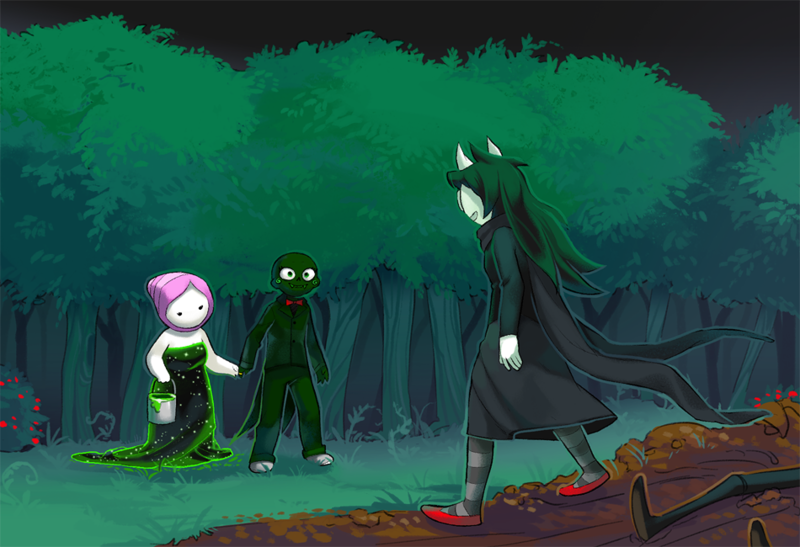 I mean, if Calliope has mastered her aspect, and it seems like she has because so far I guess she's crazy good at it, through loneliness, and Jade is doing so, then I worry about Kanaya and in fact I was specifically thinking of Terezi re: the communion with other selves' memories - davepeta doesn't say that you can't do it, necessarily, but that a mortal mind couldn't withstand doing it. Hey did this end yet? No. Give it a week. We'll make a BAD HOMESTUCK thread for you to keep us updated in. Is anyone else getting a bug where it says this thread has at least ten more pages but won't let you go past page 162? That sure was a lot of action! Guys, it might actually end. I'm scared! It's a thing site-wide. It'll repair itself over time. I love the Undertale reference. I mean, totally obvious, but still glad it was included. "hey toby what do you want to call your part of the song"
"hmm, how about you guys come up with a name"
We'll make a BAD HOMESTUCK thread for you to keep us updated in. You have NO IDEA how badly I want you to carry out this threat/promise. The important question is who did Davepeta kill to get all that HP? This makes me pretty sure any future animations will use songs that we already heard, at least on past albums, and Collide is the soundtrack finale. How the hell is Homestuck ending? I feel like nothing has been resolved and I have no idea what's going on. It really feels more like Hussie throwing up his hands and saying 'I'm done' compared to how previous story arcs ended. I suspect there's quite a lot more material yet to come than might be implied by the timeline. The big fight was a smokescreen and LE's about to do something sneaky. As for what's going on... in the session, the kids are fighting some various villains (pawns of LE) and using up their extra lives. In the dream bubbles, Vriska is about to use a juju on LE and her plan's about to go really poorly. In the "past" LE just acquired that same juju and we might be about to learn more of how he arranged everything and got where we are now. Still waiting for the entirely too thoroughly overshadowed cherub switcheroo over here. Especially with a fresh coat of foreshadowing since that chess game was like 30 years ago now. Yeah ... I thought it was just a little strange that at the end of the "final battle" LE was still looking pretty strong. I also figured that alternate (?) Calliope was going to somehow destroy the green sun, and that was going to play a role in that last animation, but I guess that's still to come, whatever's going to happen. That makes me suspect that the final confrontation with LE isn't actually a battle at all.